CAWP occupies the eastern portion of the Forest Sciences Centre complex; it is a two-storey U-shaped building with a gated courtyard that faces onto East Mall. The closest public parking is across East Mall off Agronomy Road in the C2 lot, east of CAWP. There is another surface parking lot (Lot B4) on the west side of the Forest Sciences Building, accessible from Agronomy Road. Both of these lots fill up quickly when classes are in session (Jan to April and September to December). If you are arriving after 9am you may need to go to the Thunderbird Parkade, which is just east of the C2 lot (access it by driving east on Agronomy Road and making two rights). 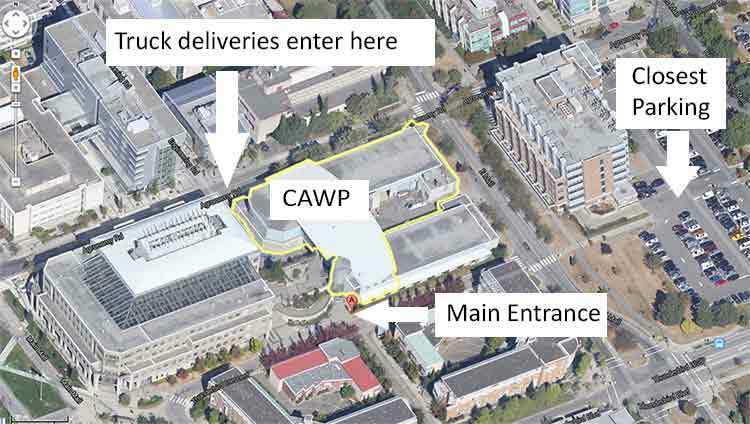 The main entrance to CAWP is on Thunderbird Crescent on the south side of the building. Take the elevator or stairs to the second floor to reach Reception. For deliveries of lumber, machinery or larger items to our lab, trucks should enter the courtyard from Agronomy Road on the north side (click map below for larger image). Note: Unsolicited commercial emails that attempt to sell products/services to CAWP are banned on this email address. Unsolicited commercial emails will be added to the banned user/domain filter and future emails deleted upon arrival. We try hard to make CAWP’s website the best it can be. Your views on what we’re doing and how we could make things even better are important to us. So if there’s anything you want to say, please e-mail us or use the form below.